There are many different types of walls in terms of design, construction and purpose. In this particular aspect of our work we are primarily looking at external walls designed for use as boundaries, retainers and those associated with gates. 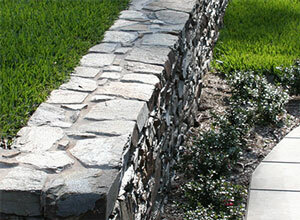 Drystone walls are the best way to retain a bank because they don't rot, crack or suffer moisture damage. The way they're constructed allows them to absorb any movement or subsidence and still retain their beauty and character after many decades. When properly designed and constructed they allow moisture to pass right through them. 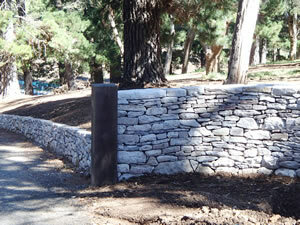 They are longer lasting than most alternative types and comparable in price to many other retaining wall constructions. They can be built with local materials as any stone can be used. Dry stone walls don't require footings and are able to cope with reactive soils and will outlast other fencing when built correctly. We have worked with all kinds of stone such as sandstone, granite, basalt, trackite, shale and from huge stone boulder walls to book-leaf walls. 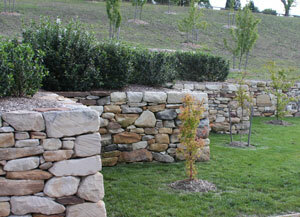 Examples of the various types and styles of walls we've constructed can be viewed in our Drystone Walls photo gallery. View more of our work in other types of stonework in the Homes and Garden Features.